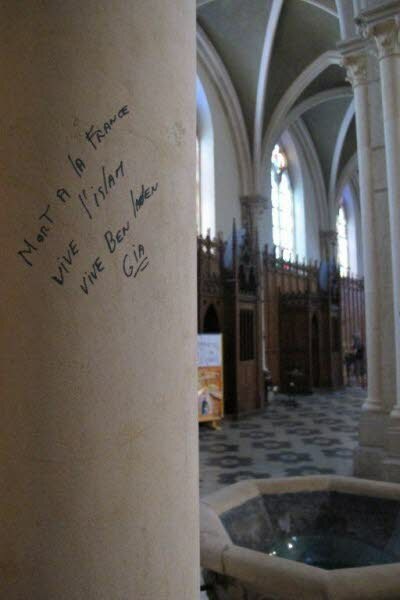 French Church Vandalized: "Death to France, Long Live Islam, Long Live Bin Laden"
Saint John the Baptist Church in Bourgoin-Jallieu was vandalized by an Islamist this week. On Saturday morning a parishioner discovered the graffiti on the wall of the Saint John the Baptist church in Bourgoin-Jallieu. These were done with a marker on two pillars, and on a notice on a panel at the back of the church. The messages were signed GIA, which may be a reference to the armed Islamic group. [Armed Islamic Group of Algeria].